We recently traveled to San Francisco to produce a marketing videos for one of our top clients. We had a great shoot and turned out a final video that we are very proud of and we've seen make an impact on the students and staff that were involved in the filming. Take a look for yourself and any feedback would be greatly appreciated but only if it's positive....haha. Where to begin??? Our company is based in Wilmington, NC and the last several weeks have been a roller coaster to say the least. This storm was massive and brought a lot of havoc to a lot of people in North and South Carolina. In fact it's still creating havoc and flooding around both states and that is absolutely heartbreaking to us. We are fine and our region will rebuild and be better and stronger than before. We simply ask for continued prayers for all the families of those who lost their lives, those who lost homes and businesses and all those who have been affected mentally and physically by this horrific hurricane. What's the point of hurricanes??? Only God knows and for that reason we will continue to trust in his plan for all of our lives. It's been a long journey from writing 'The Terrible Two' to now seeing it come full circle and be in every Redbox around the United States. We are so happy that this has happened. We have our Sales Agents at High Octane Pictures and our US Distributor Un'Corkd Entertainment for helping us to turn this dream into a reality. We made this entire feature film for under $35,000 and that is a feat in and of itself. It was a struggle and we have received some less than stellar reviews on the film but you what? Who Cares? We made another feature film that is being seen by the world. We are so blessed and give all the glory to this accomplishment to God. Without Jesus we would be nowhere. Thanks for continued to support and please rent, watch and rate the film and continue to support independent film. 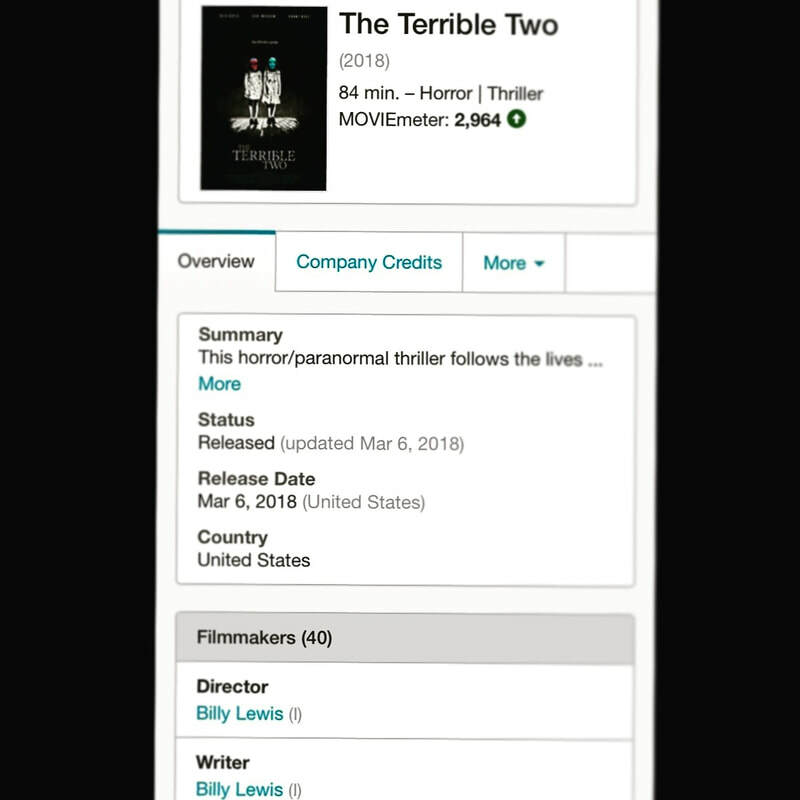 It's been out for nearly a month now but we are very proud and happy that our original film 'The Terrible Two' is out on Video on Demand for the world to see!!!! You can find all of the VOD links on the front page of our website or on the official film website listed above. We made the entire film for $35,000....the entire feature film was made for $35K and now the world can watch the movie. Rent the film and give us your honest feedback on the film so we can continue to grow as filmmakers. First off Happy 2018 to everyone out there. We are so thankful to make it to another year and truly give God all the glory. We've been doing a lot of work in Atlanta the last couple of months through one of our top clients, School Specialty Inc. They are a very philanthropic company that has partnered with the College Football Playoff Foundation to provide Classroom Makeovers to deserving teachers across the United States. This year they focused on giving the makeovers away to teachers in the Atlanta Public School systems and we were lucky enough to be able to film and produce a couple different makeovers in the city of Atlanta. It's a humbling experience to see the reaction of the teachers who get all new desks, technology and varying safety components for their new classroom. But more rewarding is seeing the faces of the kids when they first see their new rooms. This was never on display more than when we captured the classroom makeover at M.A. Jones Elementary Schools. It's fascinating to watch and we were overjoyed by the response that this video we produced has received. Take a look for yourself and please give us feedback. Thanks and make 2018 the best year yet. As we put the final touches on the year of 2017 we are blown away by the opportunities that have come our way this year. We've gotten to produce short films, make new music videos, work with some of the bigger corporations in America, and the list goes on and on. For all those associated with #OrangeStFilms we say thank you for your hard work and dedication to this very unique craft of Film and Video Production. As we roll into 2018 we can only hope it's half as good as this year has been. Only God knows what the future holds so we will leave that in his hands and continue to produce great work, be honest and give thanks for every opportunity that comes our way. Here is a video we recently produced for Brunswick County Schools that we know will have a positive impact through it's message. Take a look at this and more importantly take a look around you and realize the blessings you've been given. First of all late Happy 4th of July to all. We want to thank all of those who have fought to protect our freedom over the years so that we may live free as the greatest country on earth. And also a big thank you to the forefathers who helped create this country back in 1776. With that being said we recently #produced a short military film called 'Suppressed'. Amazingly we shot the entire film in one day. So we don't want to hear any excuses of why your new project cannot be completed in an ample amount of time. The film focuses on a soldier who has been on multiple tours of duties and the harsh realities these tours do to our soldiers. Our hopes is that this little film will reach our military personnel or anyone who may be struggling with #PTSD or #Depression. Don't be afraid to seek help if you are struggling with these conditions. This film is why we do what we do and we hope you will take a minute to view the entire short film and take to heart that it's never to late to get help and you do have options in the grips of depression. Stay safe and work hard.